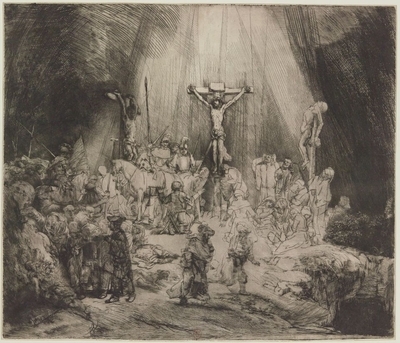 Rembrandt is cast not only as a master printmaker of glorious works, but also as a canny market manipulator in the Denver Art Museum's latest show, Rembrandt: Painter as Printmaker. "Rembrandt intentionally made rarities for his admiring collectors, who sought out rare states," says the co-curator Timothy Standring, who organised the show with Jaco Rutgers, co-editor of the catalogue raisonné of Rembrandt's etchings, completed in 2014. The scholarship behind the exhibition stems largely from that project. The Dutch Old Master, who generally sold his own impressions, is already known as a more innovative printmaker than his contemporaries, frequently experimenting with different inks and papers. In creating his etchings, he refined his copper- plate designs in small steps, known as "states". Rembrandt made lots of them—some seemingly unnecessary, or at least not aligned with the common practice among artists of using these early versions as a "status report" on the composition. Standring says that Rembrandt knew his collectors wanted rarities, which sold for high prices, and he purposely churned them out. "Why did he print so many first states of the so-called Jewish Bride? Or the many states of his self-portrait in which he etched only the head and upper part of his bust, and then added black chalk in a similar manner to six or more impressions?" The artist certainly needed the money, as evidenced by his 1656 bankruptcy declaration. The show encompases more than 100 prints, as well 17 drawings and four paintings, and includes works with biblical, portrait, allegory, still life, landscape and genre themes. The Bibliotheque Nationale de France, which owns one of the world's most significant collections of Rembrandt prints, provided 75 of them; other lenders include the Louvre, the Albertina, the British Museum and the Metropolitan Museum of Art. The exhibition runs from Sept. 18 to Jan. 6, 2019, thus ushering in commemorations of the 350th anniversary of Rembrandt's death in 1669. The main sponsor is Bank of America.